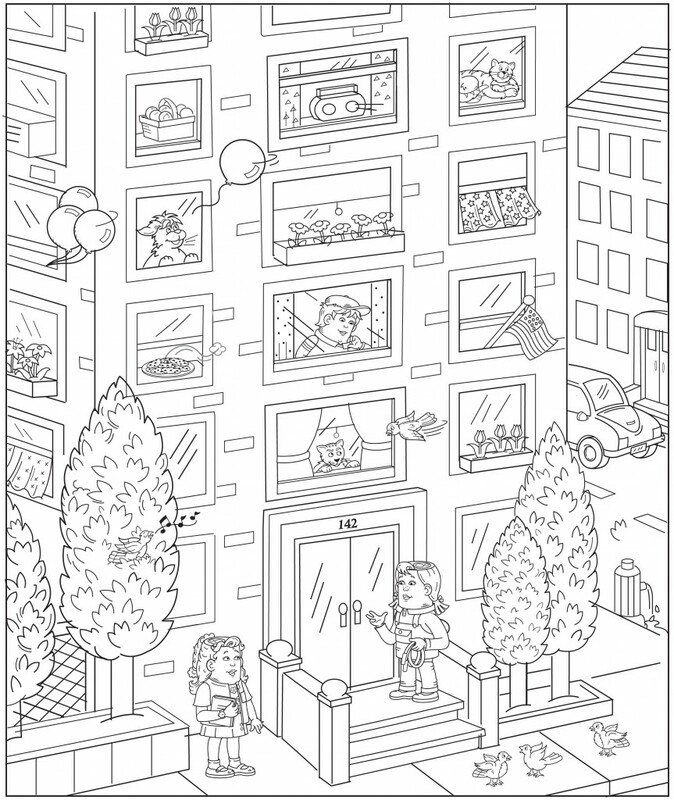 Before you print this out and color it, let’s see how much you know about the Can Do Street characters. You may have to check the site to get names! Willie and Nellie knew there was something wrong when Grandpa Dooley met them at the door. “Willie, Nellie, Grandma Hattie fell and sprained her ankle today. She is resting in the living room,” said their grandpa. “Nellie asked,”Is she going to be okay?” Grandpa nodded ad led them into the living room. There was Grandma Hattie, her foot propped up on a cushion, with her ankle wrapped. Nellie and Willie were careful not to touch her ankle when they hugged her. Grandpa asked Willie and Nellie to sit down as he needed to talk with them about how they were going to have to be Grandma Hattie helpers until her ankle was better and she could walk on it again. Grandpa reminded them that he had to drive the school bus every morning and teach a music class in the afternoon. He would be out when they were getting ready for school, and would be out when they got home from school on Tuesdays and Thursdays. Willie and Nellie looked unsure, but nodded in agreement. Willie said, “I’m supposed to got to Orrie’s for a play date tomorrow. Can I still go?” Grandpa shook his head no, and told Willie he was needed around the house. Grandpa suggested that Willie call Orrie and explain why he couldn’t come over the next day. As they were talking, the doorbell rang. There stood Grandma Maureen, a dinner casserole in one hand and a list in the other. In she marched, checked out Grandma Hattie, sat down and began to read from the Grandma Hattie Helpers list. Grandma Frances, Grandma Sue and some of the ladies from the senior group would drop off dinner meals each night. Grandma Maureen would do the ironing once a week, and look in on grandma each morning when grandpa was driving the school bus and Willie and Nellie had left for school. Some of the “Can Do Kids, who live nearby, signed up to help Willie and Nellie with their after school chores. It was the monthly meeting of the “Can Do” Kids Cooking Club and all the members were lined up outside the small kitchen behind the cafeteria in the “Can Do” Street Community Center. It wasn’t much of a kitchen but it was all they had to work in. It really was a kitchen for adults. The counters were too high for them. They needed to stand on stools to reach the counter tops and do their preparations. The oven and refrigerator doors were too heavy for them, so Miss Hattie, the club moderator, always had to open these doors for them. They brought all the ingredients they would need to make sandwiches and flower cupcakes to serve at the “Spring Luncheon” for the seniors club. Every year the “Can Do” Kids Cooking Club made and served sandwiches and a special dessert. They looked forward to the event and so did the seniors, especially since their grandmas were in the seniors club. The “Can Do”s were getting nervous. Why was the kitchen door locked? Where was Miss Sue, the center director, to let them in to the kitchen? Where was Miss Hattie? It was getting late. If they didn’t get started soon they would be late getting the food to the luncheon. When the seniors stepped away from where the cabinets were, the “Can Do” Kids Cooking Club members couldn’t believe their eyes! The kitchen was all new with cabinets and cupboards and counter tops that were just the right height for kids. Why, there was even a stove and refrigerator that was just the right height for them that had easy to open doors. The “Can Do” kids were so happy. They hugged each and every senior as each senior headed upstairs to their meeting room. Then they got busy in the new kitchen, making sandwiches and the prettiest flower cupcakes! Water Park Here we Come! Read all the signs before going on a ride. Make sure you are tall enough and old enough. Ask questions if you are not sure about how you’re supposed to go on the ride. When you go from ride to ride, don’t run. It’s slippery! Bumping into others on a slide can hurt. That’s why no “chains” of people are allowed on water rides. So, count five seconds after the rider ahead of you has gone before you take your turn. Wear a life preserver — the water park supplies it for a reason. Have fun at the water park Nellie and Willie! Take pictures!